Cold in-place recycling (CIR) has become an attractive method for rehabilitating asphalt roads that have good subgrade support and are suffering distress related to non-structural aging and cracking of the pavement layer. Although CIR is widely used, its use could be expanded if its performance were more predictable. Transportation officials have observed roads that were recycled under similar circumstances perform very differently for no clear reason. Moreover, a rational mix design has not yet been developed, design assumptions regarding the structural support of the CIR layer remain empirical and conservative, and there is no clear understanding of the cause-effect relationships between the choices made during the design/construction process and the resulting performance. The objective of this project is to investigate these relationships, especially concerning the age of the recycled pavement, cumulative traffic volume, support conditions, aged engineering properties of the CIR materials, and road performance. 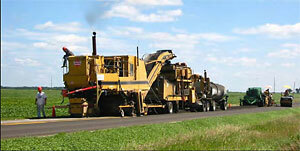 24 CIR asphalt roads constructed in Iowa from 1986 to 2004 were studied: 18 were selected from a sample of roads studied in a previous research project (HR-392), and 6 were selected from newer CIR projects constructed after 1999. Three separate reports came out of this project. They present the results of a comprehensive program of field distress surveys, field testing, and laboratory testing for these CIR asphalt roads. The results of this research can help identify changes that should be made with regard to design, material selection, and construction in order to lengthen the time between rehabilitation cycles and improve the performance and cost-effectiveness of future recycled roads.